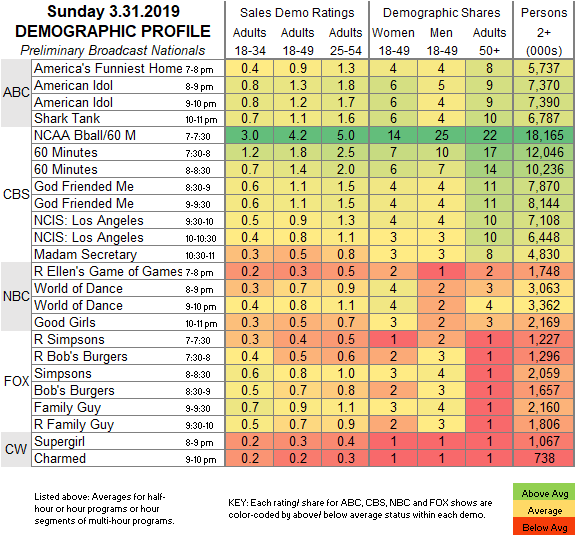 Note the errors on the charts below: ABC aired a 3-hour AMERICAN IDOL rather than SHARK TANK, and BOB’S BURGERS was a rerun. ABC: AMERICA’S FUNNIEST HOME VIDEOS aired its first new episode in 3 weeks and was steady at 0.9. The 3-hour AMERICAN IDOL held last week’s 2-hour 1.2. CBS: An NCAA TOURNAMENT overrun pushed the primetime schedule, which will be subject to adjustment. Currently, 60 MINUTES is steady at 1.6, GOD FRIENDED ME is up 0.2 to 1.1, NCIS: LA is steady at 0.9, and MADAM SECRETARY is down 0.1 to 0.5. NBC: After a rerun ELLEN’S GAME OF GAMES at 0.3, WORLD OF DANCE dropped 0.1 to 0.7, and GOOD GIRLS lost 0.1 to 0.5. FOX: THE SIMPSONS (0.8) and FAMILY GUY (0.9) were steady. The reruns that surrounded them were at 0.4-0.7. CW: SUPERGIRL (0.3) and CHARMED (0.2) were steady. Tonight, CW’s LEGENDS OF TOMORROW returns from a lengthy hiatus for the back half of its season.